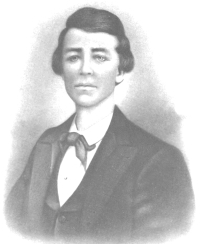 William Clark Quantrill continues to be a controversial figure in the history of Kansas, Missouri and the American Civil War. Quantrill was born in Canal Dover, Ohio, but left home to go out west in hopes of making a fortune. He arrived in the Kansas Territory in 1857 and began teaching school in the town of Stanton. Quantrill became involved in the turmoil of “Bleeding Kansas” and when the Civil War erupted, he ended up supporting the South. Quantrill ended up leading a group of Missouri guerrillas, who waged a vicious war against the Union authorities. Although the Union army had succeeded in driving the Confederate army out of the state in 1862, they struggled to contain the guerrilla war that ensued, particularly along the border between Kansas and Missouri, where Quantrill operated. Quantrill led a number of raids into Kansas, but his signature event was the August 21, 1863, raid of Lawrence, Kansas.